Italians like to celebrate carnivale time eating Frappe and Sweet Ravioli. 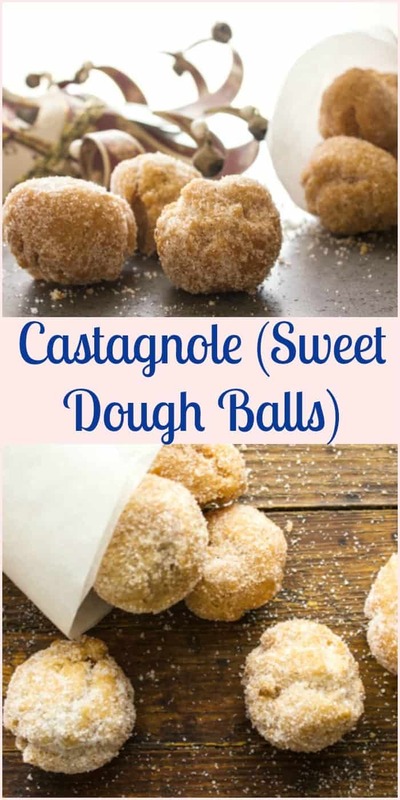 One of my family’s favourite are these Castagnole. Here in Italy it is almost that time of the year again. 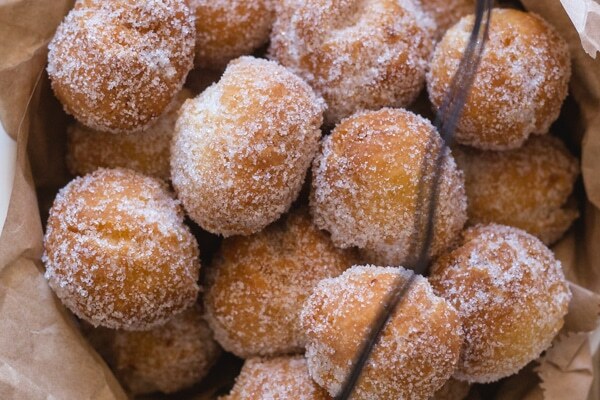 Castagnole time or also known as Carnevale. It is probably one of the biggest holidays of the year, except that it lasts 2 weeks. Carnevale (Carnival) is a festival that is celebrated in Countries celebrating the Catholic Faith. There is no fixed date since the period it is held depends on when Easter falls. However, it is always during February or March. Lasting approximately two weeks. The festivities often take place in public squares, where games, festivities and food are shared. It is a very pleasant time mainly for children, who wear costumes and celebrate with their parents in the local town square. Carnevale starts 2 weeks before the beginning of Lent and ends on Shrove Tuesday (or pancake Tuesday as I remember well). 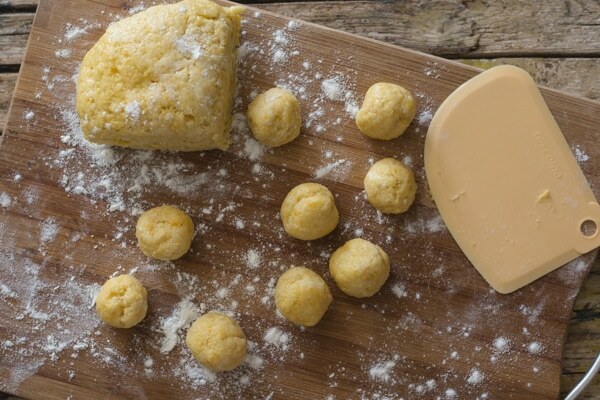 Sweet Ravioli – A slightly sweet dough filled with a ricotta filling and usually deep fried. 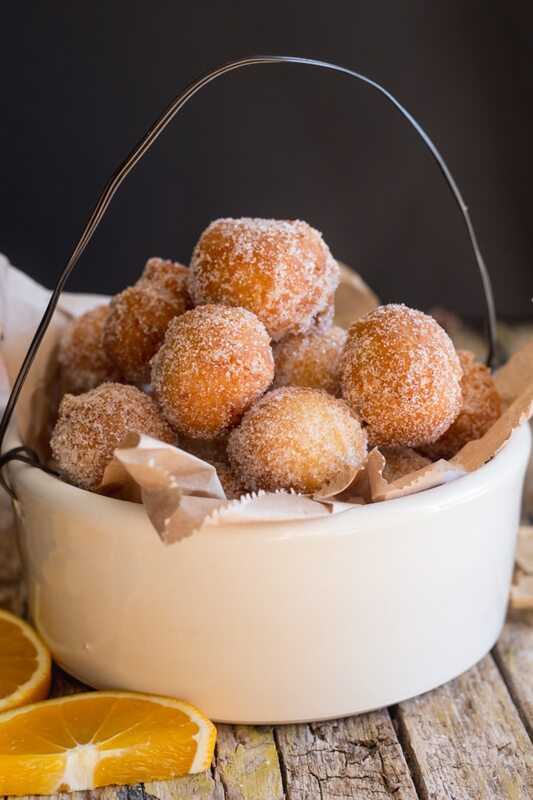 Venetian Sweet Frittelle – Soft and crispy fried balls that are usually filled with an Italian Pastry cream. 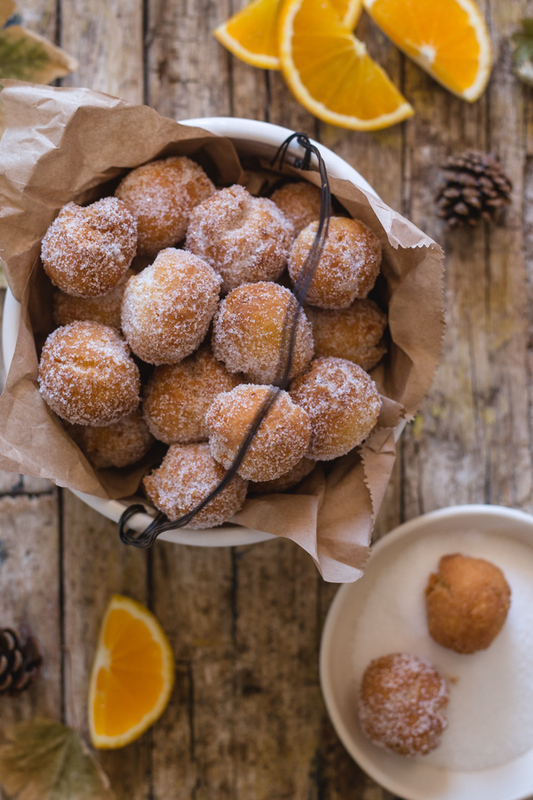 Struffoli – Are a Neapolitan dish made of deep fried balls of sweet dough. 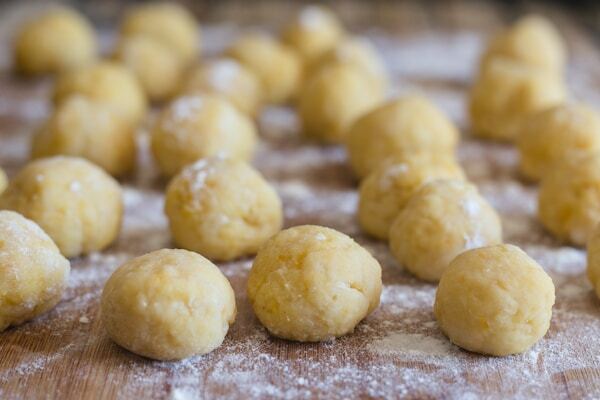 Tortelli – Known as fried cakes, as they are frying a hole is created inside where you can stuff them with your favourite filling if desired, best eaten warm rolled in sugar. Choose the correct oil, Peanut oil is considered the best because it has a delicate flavour. I usually use an oil specifically made for frying. Make sure you use enough oil, food should be able to move freely and not stick to the bottom. A good rule is fill the pot to half full or at least 2 – 3 inches of oil. Be sure to heat your oil before frying, I always use a thermometer. You could also try by throwing in the pan a crouton or a piece of carrot. If it starts to sizzle and forms a lot of bubbles around it, then the oil is ready to start frying. Although I don’t like this way, because it is hard to tell if your oil gets too hot, then the food fries too quickly, when the oil is not hot enough then the food does not cook on the inside. Always fry a few pieces at a time, because too many together can lower the temperature of the oil. Which can leave the food less crispy and greasier. Place fried food on a paper towel lined plate to remove excess oil. If you are frying a lot of food keep the food warm in an oven that has been pre-heated (but has been turned off) and with the door half opened. Do not cover them, or they will become soggy. Fried food is always best eaten immediately. When I woke up this morning I was reminded by my daughter and my husband that Shrove Tuesday was just around the corner and shouldn’t I get a start on those Castagnole? And while I was at it I should probably whip up some Frappe too! 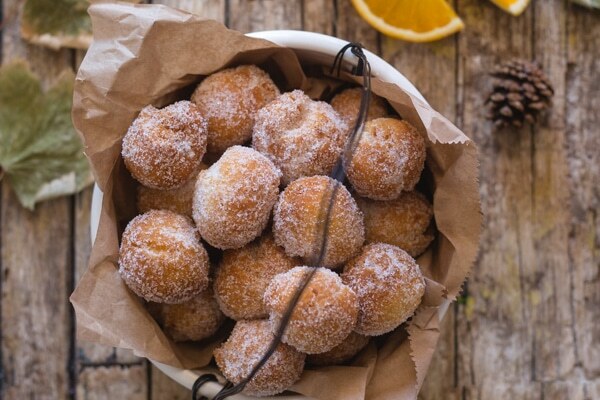 Castagnole / Italian Sweet Dough Balls are a traditional sweet treat made only during this time of the year. Deliciously crunchy on the outside and soft on the inside. Easy to make and so good to eat. Enjoy! 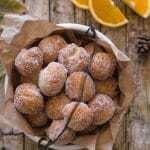 These delicious sweet treats are called castagnole for their shape, because castagnole in english means chestnut. 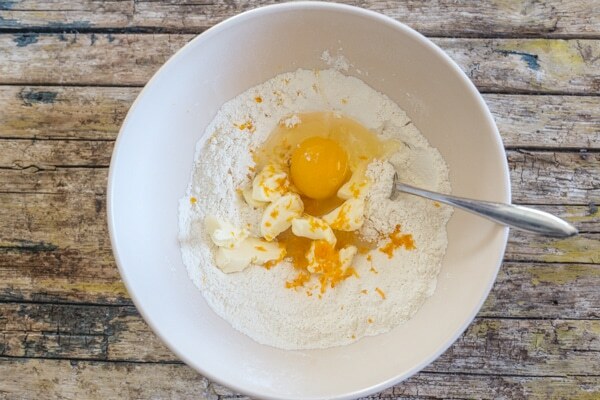 In a large bowl whisk together flour, baking powder. 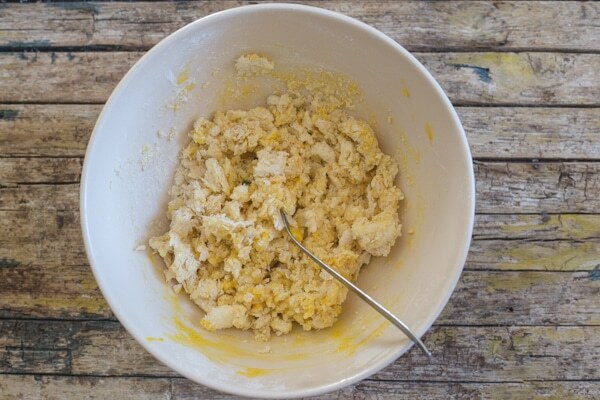 Make a well in the middle and add the sugar, eggs, zest, vanilla, softened butter, salt and liqueur (or Orange Juice). Mix together with a fork until almost combined then move to a flat surface (lightly floured if needed) and knead into a smooth soft dough. Wrap in plastic and let rest 30 minutes at room temperature. 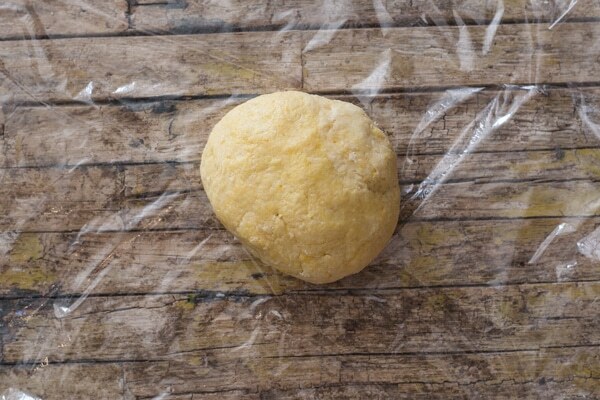 Cut a piece of dough at a time, and roll the dough to form a 1 inch (2 cm) thick rope. Cut the rope in pieces the size of large (I cut mine very large) cherries and roll between your hands to form balls. Meanwhile, start heating the oil (in a large fryer or deep pot halfway full), make sure the temperature remains between 335 - 345F (170-175C), (too high and they cook on the outside but not in the middle / too low and they remain soggy). Once oil is at the correct temperature, fry a few Castagnole at a time, until they are golden brown and nicely puffed. Approximately 2-3 minutes, but turn often so they brown on all sides. Drain on paper towels, when cool enough to touch, but still quite warm, roll in granulated sugar. Serve immediately. Enjoy. Updated from March 1, 2014. Definitely will be making these. Just hope I don’t eat them all. Castagnole are really the Carnival’s best ! Grazie milla ! Thanks they really are! Have a great weekend. 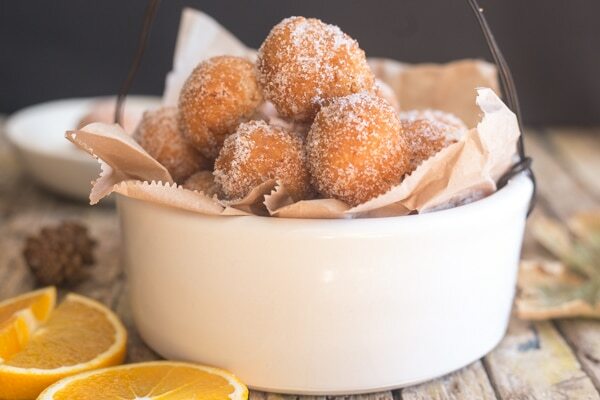 Those look so good! Thanks for linking up with the Tasty Tuesday’s Link-up. I have pinned your post to the Tasty’s Tuesday’s Pinterest Board! Ohh! Yummy! These sound and look fantastic! I will have to try these for sure!